I only have three of the eight polishes in the Nubar Prisms collection. None of the other colours really grabbed me enough to order from overseas. But I love gold, brown and neutral tones so I got Jewel, Gem and Spark. 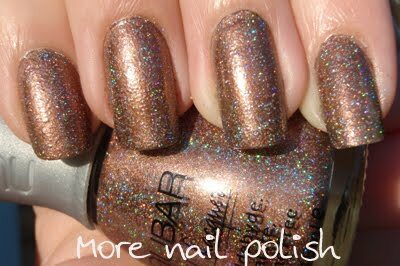 Nubar Jewel - This is a brown base with a stack of holographic glitter. This polish was actually very gritty and I was a little disappointed how it looked on the nail. In the bottle it looks amazing. It really needs a couple of coats of a good top coat, which I didn't do for this swatch. This holographic polish isn't like any of the other holographic polishes I have (CG OMG and Kaleidoscopes) which have a totally smooth finish, with the holographic particles forming part of the polish. This is really just a brown shimmer with lots of holo glitter. I still really like it, and will wear it quite a lot, but just not what I was expecting. This was three coats. 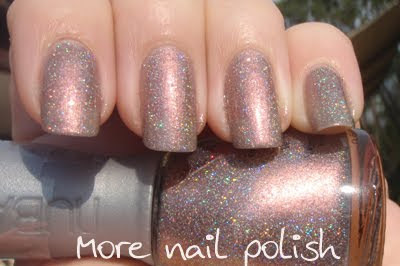 Nubar Gem - Is a pinky taupe version of Jewel. It too was gritty cause of the holographic glitter. It's basically a shimmer polish with glitter added. Still a lovely polish. 3 coats. 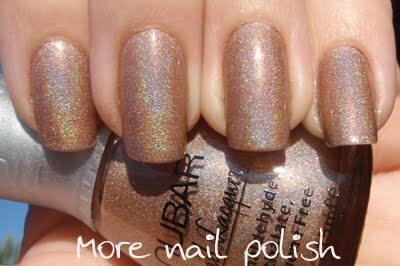 Nubar Spark - A neutral flesh coloured holo polish. Really blends with my skin tones, and inside it looks quite flat and natural. Outside the holo shows through. This polish is totally different from Gem and Jewel. It's much more like CG OMG Collection (although not as strong a holographic effect) because it has a totally smooth finish and the holographic particles are part of the polish, not just holo glitter. This was my first try of Nubar polishes and I'm pretty happy with them. These holographic polishes seem to last longer on my nails than CG OMG and Kaleidoscopes collections do. Application was easy and I'm very happy I got these from overseas to add to my collection. Very pretty! I don't have any Nubar polish yet. This 3 color are amazing!! Love it!